Mindfulness is a trend that has really taken off recently. This may be because everyone is just so busy, stressed and anxious that we have forgotten what it means to savour something or how to actually be present in a moment. Every second article you read on a Facebook feed or popular blog is about being more mindful in your day to day life; eating more mindfully, socialising mindfully or practising mindfulness, yoga or meditation. But how to drink mindfully is fast becoming an important part of the conscious movement and we are all aboard that train! Mindfulness is when the mind is fully tuned into what’s happening, the space you occupy, and the activity you’re engaged in. Living mindfully means that you are completely present in that moment, aware of everything that is going on around you, and not tempting yourself into reacting or being overwhelmed by these things. When we’re mindful, we reduce stress, enhance performance, gain insight and awareness through observing our own mind, and increase our attention to others’ well-being. What does it mean to drink mindfully? Can you recall a time when you arrived at a party or an event and went straight to the bar? This may be because you were nervous, excited, or socially anxious, or you just bee-lined to the bar out of habit. Another thing to consider is that we constantly want to do something with our hands, so holding a glass and drinking is a way to keep our hands occupied while we are in a conversation and socialising. The result is that we find ourselves drinking and not even thinking about it, not to mention whether we really wanted that drink in the first place. Or the second drink. And especially not the seventh drink; by that point, the ability to drink mindfully is very hard to get a grip on, as may be the rest of your evening. If we drink mindfully, it means we are experiencing the drink and deciding whether we like it, considering whether we would like another one, and maybe even tossing up whether it would be worth the headache tomorrow if we had too many. When we drink mindfully we are able to decide whether or not we will be drinking that night and it will be our decision. Not our friends’ decision. Not a cultural decision. Our decision. It is common to turn to alcohol as a way to cope or deal with certain situations, whether that be stress at work, anxiety, relationship issues or a range of different emotional strains that we think drinking will help with. Sometimes it may relieve these difficult emotions in the short term. But if these issues are not resolved, a dependence on drinking may be added the list. 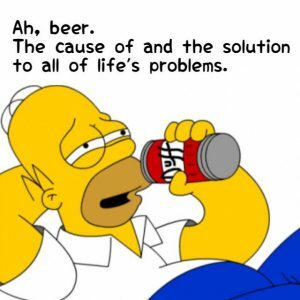 So if we are mindful of how we are feeling or why we drink, we can understand that no matter what Homer Simpson says, drinking will not solve any problems. In turn, learning to drink mindfully helps us develop a healthier relationship with alcohol. How can I drink mindfully? Mindfulness is a practice and it requires you to be fully present. For example, if you want to drink mindfully, you need to first pause and ask yourself whether you want the alcohol or not. You may be going out to dinner with some friends and they are all planning on having a ‘big night’. But you have an early morning activity lined up the next day. So, you would check in with yourself to see if you feel like a drink that may lead to more drinks. Alternatively, you may just feel like a delicious meal and treating yourself with dessert instead. Maybe you’re invited out to drinks with friends. In this case, to drink mindfully you wouldn’t order four of the cheapest house wines. Rather, you could order one delicious and expensive cocktail to enjoy for the duration of the night. A third way to drink mindfully at parties and events is to just be present when you arrive for the first ten minutes, without heading to the bar. Suss out the crowd and the vibe of the place, greet your friends and then decide whether you feel like a drink. You may surprise yourself by realising you actually don’t need to drink to enjoy yourself. Remember that this takes time, so allow yourself the time and maybe a few practice attempts! How can you incorporate mindfulness into other areas of your life? Try this mindfulness technique from our ‘experiments’ list on Hello Sunday Morning’s app, Daybreak. When experiencing an urge, it may be easy to feel overwhelmed by the internal experience. Mindfulness reduces the likelihood of getting caught up in the urge. Mindfulness is the ability to be fully present in the moment and aware of our surroundings; noticing our thoughts and emotions as elements of our present experience and not the entire experience itself. Set aside time each day to practice mindfulness. Practicing daily means that you will be in a better position to practice mindfulness when you need it. For example, when experiencing an urge or distressing thoughts and feelings. Sit or stand still and observe your surroundings. Where are you? What can you see, hear and feel? Also, notice your thoughts and feelings in the present moment. You will experience distracting thoughts and feelings. For example, you may notice yourself making a judgement or you may remember something you need to do. Do not engage the thoughts or feelings, but simply notice them and let them roll by. Acknowledge your thoughts and feelings and then return to what you were doing, which is noticing the present moment. Don’t judge yourself or your thoughts and feelings as good or bad; just gently bring your mind back to the present. This skill takes practice, so go easy on yourself. It is natural to have many thoughts going through our minds at any time. Remember, thoughts come and go and you are not your thoughts; you are much more than your thoughts.